They're big doses of Formula 1 nostalgia that, as the new season draws ever closer, have brought it home just how much the sport has changed in my relatively short lifetime. ESPN Classic began showing the original TV broadcasts of the British Grands Prix of the 1970s last year, and those of us who get the channel (not me) raved about them. It was the first time they had been seen in full since they were aired at the time. And what a treat they are. I've only got my hands on four of them, but believe me, I'm not complaining. I've just watched the 1973, '74, '78 and '80 British GPs and it gave me a visual insight I could never get from any history book or magazine. The '73 GP is famous for two things: Jody Scheckter's field-decimating shunt at the end of the first lap, and Jackie Stewart's trip through the cornfield at Stowe. The thing that really hits home about the Scheckter shunt was not so much the violence of the incident (although this can't be underestimated - Jody was a lucky boy). More startling is the potential tragedy that Stewart and Ronnie Peterson do well to avoid when they come round to finish the lap. Stewart comes tonking into Woodcote at 150mph, drifting his Tyrrell 006 to perfection. But there's a bloke standing almost on the racing line waving a solitary red flag. Jackie throws on the anchors as the devastation in front of him becomes obvious. Fortunately for him and the marshals and drivers still on the scene, Ronnie reacts quickly too. His JPS Lotus 72 almost piles into the back of the Tyrrell, but the black and gold car slithers to a halt. What has just been avoided doesn't bear thinking about. The second highlight, the cornfield incident, is ingrained in my memory even though I've only seen it a handful of times. I'm sure the same is true for many of you. The camera looking down from the ubiquitous Goodyear Airship watches JYS make a lunge up the inside of Peterson for the lead into Stowe. It was uncharacteristically impetuous. The Tyrrell squirms one way and then the other, he looks like he's caught it, but in his anxiety to get on the throttle the car slews off into the long grass. Brilliant! Actually, watching it made me draw parallels to a modern-day hero. Just like Michael Schumacher, Stewart was clearly the quickest driver on the grid and his class stands out on the old footage - but on this day he was fallible, just as Schuey was on occasion. What makes the '73 footage just perfect is the plummy commentary of the great Raymond Baxter. His race build-up is pure class: understated, but with the right level of enthusiasm to raise the tension beautifully. It makes you feel that the British GP is a sporting event that sits comfortably with the Grand National, the FA Cup Final, the big matches at Wimbledon and so on. For the '74 race at Brands Hatch, Baxter introduces the programme to camera, his natty green, swirly tie catching the eye. They just don't make them like him anymore, do they? The first thing that strikes you about seeing a GP at Brands again is just how tight and claustrophobic it is. The main grandstand is almost on the track and the fiddly little pitlane and old pit buildings fall away sharply in the dip. Even then, it must have been starting to look out of date. 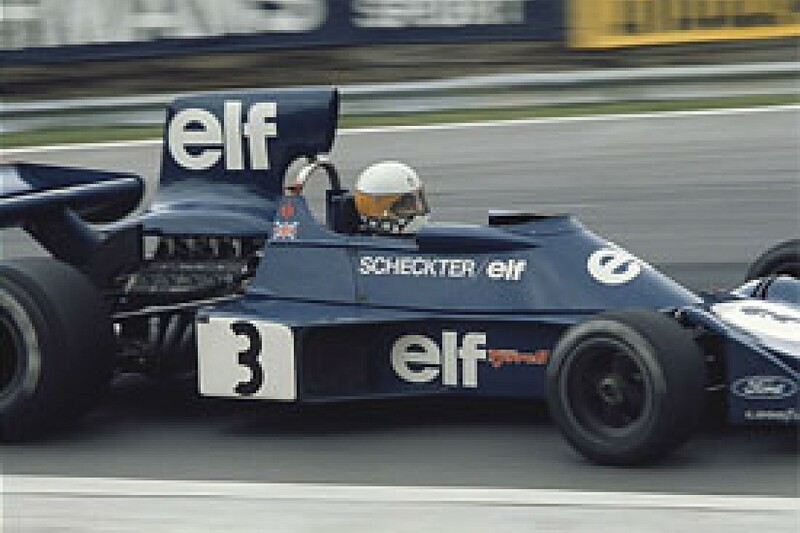 After bringing forth the wrath of John Surtees for the shunt in '73, Scheckter makes up for it this time by winning at Brands. But only after Niki Lauda dominates for Ferrari until a slow puncture develops. Eventually the tyre shreds on the penultimate lap. At this point the broadcast loses Lauda and misses the most controversial moment of the race. People are swarming around the pitlane, so much so that Lauda is barred from re-joining for the final lap. Only when pitlane reporter Barry Gill interviews Niki and team boss Luca di Montezemolo after the race does it become clear what has happened. Gill doesn't appear too interested. The TV cameras would never miss something like that these days and we should be thankful of that. But it does appear commentators had a bit more influence over what is shown on screen. Towards the end of the race the cameras are trained on Lauda as he struggles on with his tyre problem. Baxter can be faintly heard off mic saying "I think we should switch to Scheckter" - a fair point given that he's the leader of the race. The next instant, Jody's Tyrrell appears on screen to remind us he's still out there, then the shot switches back to Lauda. Now I bet ITV's James Allen would kill for that kind of control! The interviews on each of the DVDs provide some gems. Gill sticks a mic under Jody's nose on the podium and asks: "When did you know you'd won the race?" The reply? "When the flag went down..."
But my favourite comment comes on the '78 race footage. Jackie Stewart is in the commentary box, by now with Murray Walker, and a few other things have changed at Brands too. Many of the corners have been renamed after drivers and Stewart is talking a car through a lap, listing off the names as he does so. And he can't resist it: "No Stewart corner, I regret to say." It was said in a light-hearted tone, but not light-hearted enough to hide the suggestion that he is slightly put out! The '78 race is notable for being led by both Lotuses, the dominant cars of the season. It is also notable for both of them failing. Lauda's Brabham gets caught out as he laps a car and Carlos Reutemann dives through for the win. On the podium he looks as he always did: the archetypal racing hero. The final DVD in my possession, that of the 1980 race, features no commentary for some reason, which is a shame because a caption promises Murray and James Hunt, along with JYS too. But the images still grip. This time the two Ligiers lead and fail at Brands. Jacques Laffite's tyre failure is particularly alarming. Despite the problem with his rear left, he is still pushing on as he brakes for Hawthorns. The tyre gives way, the car slews out of control and he charges into the catch fencing at speed. Fortunately, his impact with a shonky-looking tyre barrier is light. But the stark lack of safety, especially compared to modern standards, makes you think. Especially when you remember this was Patrick Depailler's final race. He was killed in a horrible testing accident at Hockenheim after retiring his Alfa from Brands. The levels of danger in the sport were still so high back then. I'd rather not finish this column on a sad note, but there's more bad news. These DVDs are not for sale. We're lucky to have them in the office. It's a reminder of just how badly our sport's history is archived when it comes to TV footage. Of course there are plenty of gems out there on DVD and VHS, and at this point I have to mention Brunswick Film's excellent series of 1970s and early 1980s F1 DVDs. But it wasn't until Bernie Ecclestone took over F1's TV rights in the early 1980s that footage became a valued commodity - and too right. Alas, for anything earlier we have to rely on odds and ends turning up, and either being broadcast - as in ESPN Classic's case - or packaged into a DVD release. But then perhaps I'm missing the point. When something does turn up unexpected, that's half the fun.